If you just let out a slight gasp in awe of this technique, you’re like us. Our guffaw was two-part. First, there was the gasp in awe of the notion of carrots slathered in shimmering duck fat and roasted until suffused with the aromatic and ducky stuff. (And reader Cindy W. Rogers just reminded us in a comment below that this would probably be pretty darn lovely with parsnips, too. Much obliged, Cindy!) Second, there was the gasp in awe of the price tag attached to the amount of duck fat necessary for this recipe, which is priced somewhere in the vicinity of liquid gold. For those of you preoccupied with that second gasp, we’ll let you in on a little secret: Some of us tried this recipe with less than 1/2 cup duck fat and were still wowed. Do with that information what you will. 1. Preheat the oven to 250°F (120°C). 2. Melt the duck fat in a large metal roasting pan over medium heat. Add the carrots, turn to coat, and transfer the pan to the oven. Roast the carrots for 2 hours, basting and rotating every 15 minutes. The carrots should be very tender. 3. Drain most of the duck fat from the pan and place the pan over 2 burners on the stovetop. Add the thyme, garlic, rosemary, butter, and salt and cook the carrots over medium-high heat, basting constantly, until the butter is lightly browned. Drain the carrots on paper towels or a brown paper bag and serve immediately. These little lovelies are also quite nice when served warm, as opposed to hot from the oven, so if they need to linger on the counter a few minutes before going from baking sheet to serving dish, all is not lost. If you haven’t gotten around to buying a roasting pan or if yours is filled with something else for dinner, you can roast the carrots on a rimmed baking sheet. Simply melt the duck fat in a small saucepan while you arrange the carrots on the baking sheet and then toss them well to coat. Roast as directed above. After roasting, drain all the duck fat back into the small saucepan, add the aromatics and butter, and proceed as directed, then pour the mixture over the carrots and toss to coat. I halved the duck-fat roasted carrots recipe to serve two of us. The carrots were quite long, so I cut them in half before I placed them in the pan with the duck fat. This is definitely more like a confit technique than a roasting technique. I used the full container of duck fat, which was more than enough for the carrots. The amount of time for roasting will vary based on the thickness of the carrots. My relatively thin carrots were done in an hour. They were immersed in the duck fat, so I didn’t feel there was much need to baste and rotate them. Having recently discovered how tasty carrots and potatoes are when finished off with a bit of duck fat, this duck-fat roasted carrots recipe caught my attention right away. Rather than use vats—I mean, 3 cups—of duck fat, I went with a half recipe and tossed them generously with between 1/4 and 1/3 cup duck fat. I used very large carrots, weighing in at a total of 10 ounces, and they just fit lengthwise across my 10-inch cast iron skillet. I recommend using a skillet and an oven glove, making it easy to move the hot pan from oven to stove and back and, most importantly, basting and turning the carrots. The basting and rotating might even be accomplished by just jiggling the pan gently. Because there was such frequent attention, and at such a low temperature, I was prepared to think the recipe wouldn’t be worth the trouble, but the results won me over. The difference in texture—the almost fluffy interior—that you get with this low and slow method is similar to a perfectly baked sweet potato, but with a beautiful exterior. If you simply roasted slices of carrots in duck fat on the stovetop, they would be different—yummy, but different, less complex. When you finish the oven time and finish them off on top of the stove, most of the duck fat can be removed from the pan, and once you add the butter and herbs, the carrots brown VERY QUICKLY, so you must watch them like a hawk, as they’re done in just a few minutes. I sliced the carrots in half lengthwise for serving—a great side dish. If you wanted to do these ahead of time, I’d cook them for the 2 hours in the oven, remove them from the pan, and then when you’re ready to finish them, put them back in the pan (having removed the excess carrot-infused duck fat, which you might use for potatoes of something else in your very near future). I had some small new potatoes, which I added to the baking pan alongside the duck-fat roasted carrots. The combination was a great success and will be on our table often throughout the fall and winter. Although the seasoning was quite pleasant, I'd prefer a bit more and would double the thyme, double the garlic, and add another sprig rosemary. (I should note that the garlic cloves were of slight medium size and the rosemary sprigs were from the smaller section of the plant with thin rather than woody stems.) I did not use 3 cups rendered duck fat; instead, I opted to use enough to liberally coat the ingredients with maybe 2 to 3 tablespoons extra—I estimate this to be between 1/3 cup and 1/2 cup rendered duck fat. The roasted finished dish looked beautiful. I enjoyed the caramelized, roasted peeled garlic over those cloves, which roasted most or all of the time in their paper. This dish has a plethora of potential augmentations, including an array of roasted vegetables, use of rendered chicken fat in place of duck fat. It can even be garnished with fresh herbs for brightness and a fresh, light presentation. I imagine this duck-fat roasted carrots dish will be present on many tables--casual, dinner party, holiday table--during the upcoming fall and winter seasons! I'm challenging myself to make it a little different using a variety of root vegetables each time I prepare this recipe. These duck fat roasted carrots gave me another reason to bring my rendered duck fat out of the freezer! Just don't tell your cardiologist that you added butter, too! I felt that 3 cups duck fat for 8 carrots was a little excessive. I used 1 cup, and that seemed perfect. My 8 carrots weighed 12 to 14 ounces, although of course this depends on the size of the carrots. Cooking for 2 hours at 250°F was perfect. I expected the carrots to be mushy, but they were perfectly formed and very tender. I basted them every 30 minutes. Roasting the carrots over high heat on the stovetop with the herbs and garlic made the carrots smoky, slightly crispy, and delicious! I'll keep this bold-flavored vegetable side dish around and possibly try different colored carrots next time. 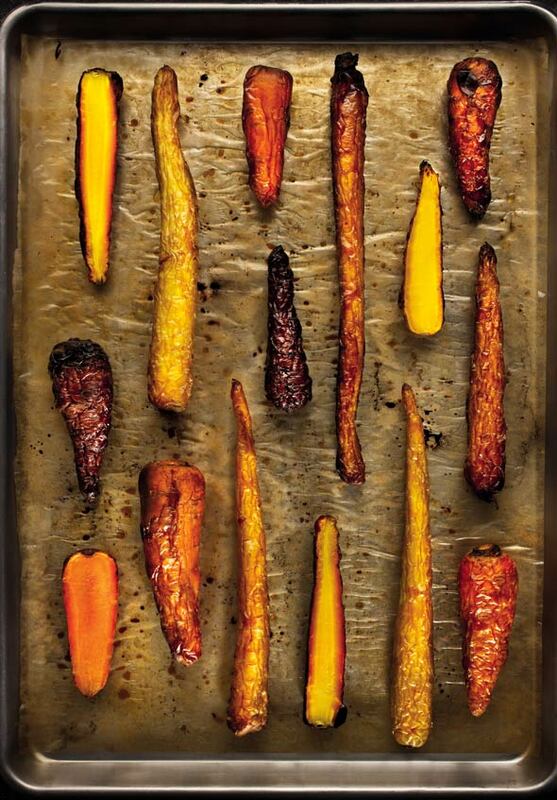 Duck-Fat Roasted Carrots Recipe © 2011 Daniel Humm. Photo © 2011 Francesco Tonelli. All rights reserved. All recipes and photos used with permission of the publisher. Yes, yes, and yes. Any day is a good day for anything duck! Would love to try with parsnips too. Yes! Parsnips are brilliant, Cindy. I’m going to borrow your notion and mention those above, giving you all due credit, natch. Many thanks! I seen your carrots baked in duck fat which look very good. I roast them with honey and butter they are a very good and easy side dish and tastes great. I have done baby beets this same style, as well as the carrots. I used my favorite coarse salt…DIVINE! Ohhhh, beets. Never made it with beets, Beth.